My recent probe into the most vital question of our era - whether football and home improvement have anything in common - was a success. So much so, I feel obligated to abandon my tiresome, coma-inducing write-ups about busted pipes and creaky stairs for a little longer. Instead, I'll tell you the story about why it was because of me that the New York Giants won the Super Bowl...and what any of that has to do with home improvement. I turned 25 in August of 2007 and I was really struggling. I was 340 pounds, smoked two packs a day, and my only daily physical activity was heaving myself in and out of my truck. I had a local trucking gig, delivering kitchen cabinets around the 5 Boroughs of New York City. I lived in a basement. Alone. Obviously. I didn't have a relationship with any family, friends, or God. It's not like I was a great guy to have around. I was cynical and intolerant of others, but I was mainly frustrated with - and felt sorry for - myself. To this day I have no idea what came over me, but something clicked in my brain and I suddenly had the drive to make a positive transformation. But I needed help. Again, I have no idea why I thought of it, but I made a deal with God: I'll go on a diet and try to be a better person if You help my beloved Giants win the Super Bowl. The deal was on. I started my diet right away and immediately started to feel better. God, on the other hand, took His time before He started kicking in on his side of the bargain. In their first two games, the Giants allowed a staggering 80 points and started the season 0-2. And in Week 3, the Giants were down at halftime to Washington, 17-3. So in the first 10 quarters of the season, the Giants had allowed 97 points. As I waited for the second half to begin, I let God know how upset I was. "I'm eating quinoa, carrots, and kale and the Giants can't catch a break?! What's that all about?" God responded. The Giants didn't allow another point in that game and came back to win 24-17. It was their first win of the season and it turned out to be the first of a six-game winning streak! Before I continue, it's worth mentioning what happened on September 30. The Giants were coming off their come-from-behind victory in Washington and were hosting the Eagles on Sunday Night Football. Earlier that day, the Mets ended their season with one of the greatest collapses in baseball history. Leading their division by 7 games on September 12, the Mets lost 12 of their last 17 games and missed the playoffs. The Giants went 10-6 that season and made the playoffs as a wild-card team. To make it to the Super Bowl, they would need to win three straight games on the road, not an easy feat. On the plus side, the Giants had proved they were a better team away from the Meadowlands. They'd gone 3-5 at home, but 7-1 on the road and they were riding a seven-game road winning streak. I kept to the deal. I had tapped into a level of willpower I never knew I had. I was going strong on my diet and cycling everyday and had lost almost 100 pounds already. Also, I quit smoking in mid-December with a few weeks left in the regular season. I was happy, I felt great, and I was full of energy. The Giants went on the road and beat Tampa, Dallas, and Green Bay - coming from behind in all three games - to earn their trip to the Super Bowl. They were going to play the Patriots who hadn't lost a game. That's right. They had gone 16-0 in the regular season and seemed unbeatable. The Super Bowl would be played on February 3, 2008, in Arizona. I don't need to get into much detail about the game itself - it's only one of the most miraculous games ever. During that magical final drive, when everything seemed to fall into place for the Giants, it was clear as day that God wanted the Giants to win and He was pulling out all the stops: Asante Samuel dropped what would have been a game-ending interception...there were several huge down-and-distance conversions...Eli Manning broke free from the grasp of a combined 584 pounds of defensive linemen and chucked the ball 32 yards down the field where David Tyree (who couldn't catch anything during practice) made the most spectacular, unbelievable, luckiest catch ever, as he jostled and jabbed with Pro-Bowl safety Rodney Harrison, he eventually managed to pin the ball with one hand against his helmet and hang on as he was violently thrown to the turf...Eli delivered a perfect ball to Plaxico Burress in the end zone and the Giants took the lead with less than 40 seconds remaining. 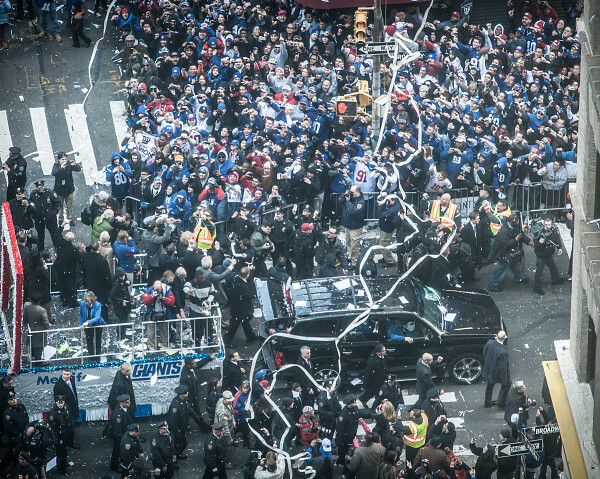 On Tuesday, February 5, the city threw a victory parade for the Giants. Hundreds of thousands of fans clogged the streets of lower Manhattan and lined Broadway. There were countless road-closures and police barricades. As big a fan as I was, I still had a job to do and didn't think I'd make it to the parade. Not only didn't I think I'd make it to the parade, I also told my boss that I doubted I'd be able to make my first stop, which was on John St. in lower Manhattan...right off of Broadway. I pulled out of the Lincoln Tunnel and headed south down the West Side Highway. The traffic was getting heavier as I reached Chambers, so I turned right onto Chambers instead of left and hoped to sneak around the parade route somehow and get to my stop. After a series of turns, I nosed the truck down Vesey. I was a block away from Broadway at this point and I thought I saw a gap between the two police barricades at the end of the street. I went for it. As I turned onto Broadway, I was greeted with the roar of thousands of fans who were waiting for the parade to begin and looking for something to cheer about. I was decked out in my finest Giants attire and the crowd's excitement consumed me. How I made it down the length of Broadway without hitting anything remains a mystery to me. My hands were definitely not on the steering wheel. I was practically standing up in the truck, blowing the horn, and sticking my head out the window. Rolls of toilet paper were thrown at the truck. When I reached John St., the cops wouldn't let me turn down and the crowd turned their attention towards the poor policemen and unleashed a tirade of contemptuous taunts at them. Unable to turn, I continued to roll down the parade route, much to the delight of everyone - not anyone more delighted than me. I had reached the pinnacle of my Giants fanhood. As far as I'm concerned, my special ride down Broadway was God's way of showing me that I deserved to be part of the parade, to be cheered for by thousands of Giants fans who had no idea who I was or the role I played in the Giants' championship. How else can anyone explain how a random delivery truck ended up on the otherwise closed-to-traffic Broadway? I almost forgot. So what does all this have to do with home improvement? Well, silly, who do you think I was delivering all those kitchen cabinets to?